Each series within the Allweiler® centrifugal pump line is designed for specific application requirements able to handle a wide range of low viscosity aggressive and non-aggressive fluids. The centrifugal pump method of operation is typically a single-flow‚ single-stage‚ volute pump available with a shaft seal or magnetically-coupled pump without a shaft seal. In a centrifugal pump‚ the process liquid enters through the suction nozzle and then the center of pump known as the impeller. 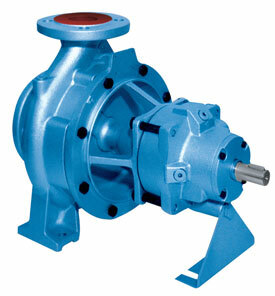 As the impeller rotates‚ it spins the liquid sitting in the cavities between the vanes outward. As the liquid leaves the eye of the impeller a low-pressure area is created causing more liquid to flow toward the inlet. The faster or bigger the impeller‚ the higher the velocity of the liquid at the vane tip and the greater the energy imparted to the liquid.